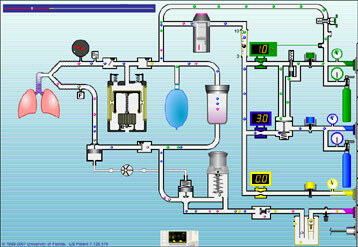 This is a transparent reality simulation of a generic anesthesia machine with a piston ventilator and a decoupled reservoir breathing bag. The user interface has been modeled in fine detail and includes volume control, pressure control, and pressure support ventilation modes. Clicking the icon at the bottom center of the simulation toggles between the machine layout and the user interface. 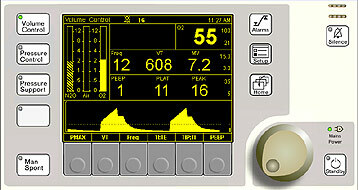 The manual breathing (reservoir) bag may be squeezed while viewing the user interface by clicking on a small bag in the top right corner of the simulation. The frequency and effort of spontaneous breathing may be adjustable while in pressure support mode. These adjustments appear below the lungs. As is the case with many modern user interface designs, changes must be confirmed by pressing the rotary knob.